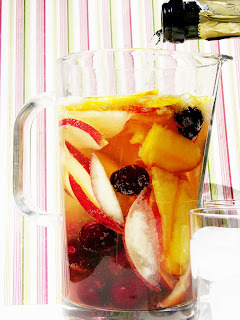 I have the perfect way for you to get your daily fruit serving: Sangria. This sparkling sangria recipe makes a great late brunch refresher and a nice fruity option for getting tipsy in the hammock. And because the fruit soaks for only a few hours, it absorbs just enough of the liquor to be snackable. Two people skilled in the fine art of tippling can easily go through a batch, so remember to stock up on bubbly. In fact, even if there’s just two of you, I’d still recommend picking up an extra bottle just in case you need to, uh, refresh those last pieces of fruit at the bottom of the pitcher. And don’t make any plans for Sunday afternoon. 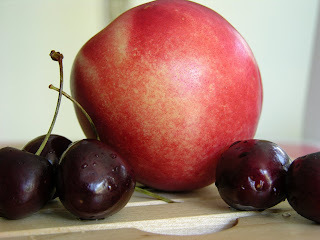 Prep: Put the fruit in a large pitcher, then pour over the bitters and maraschino liqueur. Toss well. Cover and refrigerate for 3-4 hours, stirring at least once. Serve: Stir the fruit and liqueur mixture once more, then slowly pour the sparkling wine into the pitcher, preferably at an angle to preserve the bubbles. Pour the sangria into glasses filled with ice cubes, the larger the better, making sure to put a decent amount of fruit in each glass.